A new year always brings a burning desire to make this one better than the last. Had big goals for 2016? Pat yourself on the back if you ticked them all off. And if you didn't? That's what 2017 is for. Regardless of what you made happen this year, chances are you gave your wardrobe a good run, and now is probably the time it's looking a little worse for wear. A stylish wardrobe starts with an organised closet, and if your cupboards need a little bit of rehab, I got you. I've always been a huge believer in the saying "a cluttered space, is a cluttered mind". My desk at work, my wardrobe, the bathroom cupboards—unless it's all in order, I can't feel completely and entirely relaxed. (Potentially revealing a little too much about my inner thoughts?) My best outfit combos come right after I've cleansed my closet and re-jigged the way I present my clothes. When you start to see things clearer, it makes getting dressed a whole lot easier. Keep scrolling for my three-step plan to have the most organised closet of your life. This is probably the toughest task, but once it's done, you'll feel like a weight has been lifted off your shoulders. I live by the rule that if I haven't worn a piece in a year, it goes into storage. If another year passes and I haven't thought about it, it's out (except for sentimental items like my Year 12 jerseys and very first dancing costume). It might be difficult at first to let go, but you'll feel better about it if you're either donating to charity or selling your pieces and putting the money towards something new. Think logically. Where does it make the most sense to hang your items. If you're actually wearing your T-shirts and jeans every day, maybe it's better to hang those at the start of your wardrobe, and your occasion pieces towards the back. If you're lacking in closet space (I sure am. Hey dad, I should've listened when you told me not to move out of home! ), think of creative ways to store your accessories. Look around your room at the areas you have available and the pieces you need storing. Can shoes be displayed on your chest of drawers? Can scarves and handbags be hung on hooks behind the door? As long as you're edited (as in, one bag per hook, not 20), your space will feel beautifully merchandised (as though you've just stepped into Opening Ceremony, and not your wardrobe). 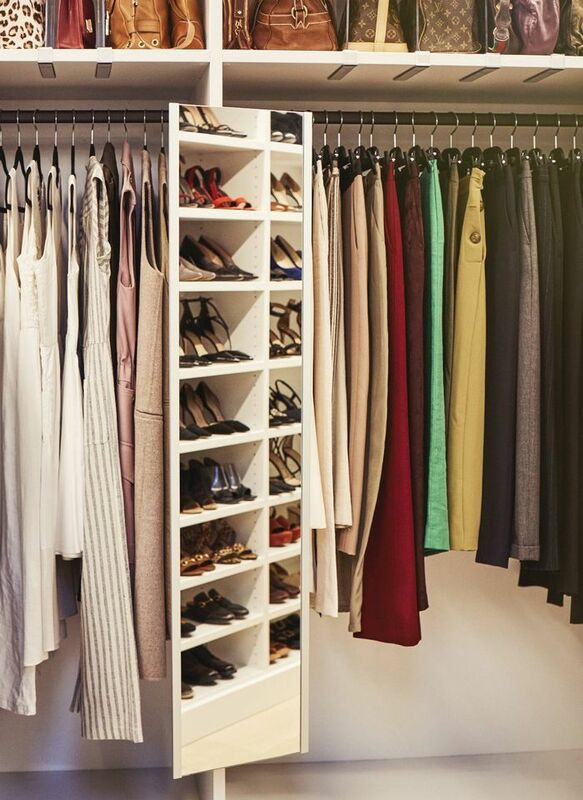 Shop pieces that'll help you have the most organised closet yet, at Howards Storage World and Container Store. Want more organisational tips? Follow us on Pinterest.